Oh I love a book that totally puts everything else out of your mind :-) I will have to look into it! funny how inch worm suddenly show up out of no where. they are cute but in great shape i bet??! I'll have to check out that book! Always looking for a good read. Oh Lisa they are beautiful. Sorry about your race , next year for sure. Spike in hits maybe you got noticed and featured by Blogs of Note? What a gorgeous flower! I would want them to last longer too. The day lily is beautiful! It's so vibrant. Sorry, I can't help with the bouncing blog thing. I have a tough time trying to keep up with technology. :-( I hope you get it fixed though. Maybe a kind soul who reads your blog will know the answer. What a pretty lily! Maybe it's an Asiatic lily? We have a lot of those and they are very colorful. We get a lot of bright orange blooms from them that are just gorgeous. Lilies are pretty! Yay for having plant success to enjoy. A good book is a simple pleasure that I enjoy too. A good book captures me and I get so caught up in the characters. My blog spam has been going crazy the last few days. It slowed down for a few weeks, which was nice. I'll take a good bounce on my blog any day of the week! Emailing you about the bounce thing. I don't know what kind of bounce you mean (I always thought a bounce was when someone emailed you and it came back because it couldn't be delivered). That's a beautiful flower and I don't know the name either! For as long as I have been blogging, I have no idea what a bounce rate is! Maybe you can enlighten me? Love that deep maroon lily! It's gorgeous! Aye!!! What a BEE-You-Tee-Fulll flower. You always seem like a breath of Light. I enjoy your posts. Can't help with the bounce rate, sorry! We have orange lilies in the yard, they were planted by the previous owners..
bounce rate? you mean high traffic surge? might be those fake hits from russian servers bouncing thru your url. if you click on any traffic source with an 'ru' extension, it seems to just invite them to bounce more. Bounce rate? Isn't that where a viewer just visits one page and then leaves the site? I don't know what makes it high--or what % high is. I wonder if, because you have a lot of regular readers, they're just reading the one page and then leaving? Let us know if you find out. I've read some of Gerrittsen's books. I have an unread one on my shelf now. But I just got Anonymous Sources, a spy mystery thriller by former NPR correspondent Mary Louise Kelly. I'm anxious to get started on that! I just planted the same kind/color of lilies this spring. They are beautiful. I don't know their name either but they are very beautiful. Love the lilies; had over 25 different kinds and colors at one time...no more. I dont run races, so didnt miss one yesterday. I just started a new book, "Gone Girl" and am anxious to get to the story. I have no clue what the bounce rate is??? Dont think I would do well as an inch worm....I am sorry as it is, and that would be even worse. Enjoy the weekend. I used to live in Boone, NC. I went to college at Applachian State. I loved the Blue Ridge Parkway. The lilies are so stunning and intense! They are beautiful and not often seen! DUH, I don't even know what a bounce rate IS? I signed up for Google Analytics a long time ago and it always says zero, so I did something wrong. I don't even know what a bounce rate is *sigh* Hope you find your reason though. I love a good picture that captures you like that too! Love the lilies, so pretty! I don't even know what a bounce rate is. oh what a pretty flower! I admire the inch worm. It's got to be a slow crawl in their world. That flower is pretty! Red is my favorite color. I have no clue about the bounce rate thing. Love your lily! If it's short, it's probably an Asiatic Lily. If tall a daylily. I don't even know what a Bounce Rate is. So sorry! Wow! 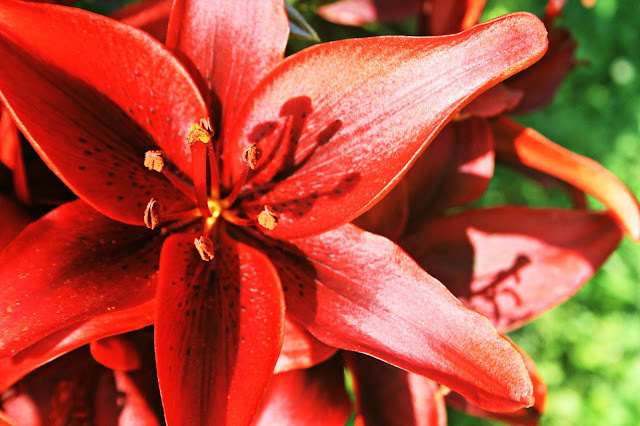 That lily is gorgeous! I agree with Tammy that is a beautiful "Asiatic Lilly " and your right they are beautiful but the blooms don't stay long. We have them in pink and yellow. Nice Lilly. I have always wished they would bloom multiple times but that is not to be. We have to enjoy their beauty while they last. I dunno about the bounce thing, and does it really matter? I mean, I just like to come here to read your blog and from what I see, I think others do too. I think that is what matters. I don't pay much attention to numbers on the blog--I just want to have some fun. Caterpillars have a high mortality rate--I would think it would be bad to be them as well. LOVE a good book to read in the summer. I take care of the house, but my blog suffers when I have a good read.